The Voice of Youth festival solemnly opened at the International Mugham Center on February 1. The event is co-organized by State Agency for Public Services and Social Innovations. The festival is timed to the National Youth Day, Trend Life reported. The public holiday takes its origin from the First Youth Forum which was held in 1996. A year later, national leader Heydar Aliyev signed a decree according to which February 2 was declared the Day of Azerbaijani Youth. The festival is held within the framework of the State Program "Azerbaijani Youth in 2017-2021", approved by order of President of Azerbaijan Ilham Aliyev. The project aims to identify talented young people, support and encourage their creative search, achievements, knowledge and skills. An exhibition timed to the Youth Day was opened in the foyer of the International Mugham Center as part of the festival. In his speech, Azerbaijan’s Culture Minister Abulfaz Garayev stressed that the state created all the conditions for young people to realize their potential and ideas. The chairman of the State Agency for Public Services and Social Innovations Ulvi Mehdiyev, noted that the country has a well-developed volunteer movement, young people are actively involved in events held in various fields. Further, young people were awarded diplomas of the Ministry of Culture of Azerbaijan for successful activities in various areas. The event continued with a concert program with participation of young people. Works of Azerbaijani and foreign composers sounded at the concert. The Voice of Youth festival will last until February 5. The festival features concert programs, meetings, photo and art exhibitions, theater productions and films with young people in various cultural fields. 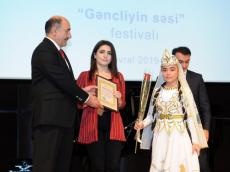 The festival covers many country's regions.With the assistance of ASAN Volunteers, the festival will be held in Sumgayit, Absheron, Guba, Imishli and Masalli.